About two years ago, I realized that I had become one those people who was "too connected." I carried two mobile phones at all times (one work phone; one personal), and was a slave to the little red light on my Blackberry (the work phone) indicating I had a new email. Whether I was out to dinner with friends, on vacation, or merely getting up to pee at 3 in the morning, if the red light was flashing, I felt compelled to see who needed what. While my remote clients (especially the international ones) grew accustomed to having instant access to me across oceans and time zones, the people I interacted with face to face often got short shrift. My own health got short-changed, as well, because sitting on the floor in the corner of the bathroom in the middle of the night responding to questions from a client in China or India does not promote restorative sleep, especially when you're already a chronic insomniac. I want to be clear, though. The electronic umbilical cord to which I was tethered was my own choice and of my own making. Sure, I have a busy career with sometimes demanding clients and challenging issues (which I enjoy very much and for which I am eternally grateful), but rarely are the issues so urgent that I need to keep my phone on the table at every meal or sneak peeks at it under a conference table during lulls in a discussion about other topics. And certainly there has never been a message that required a response from my middle of the night, dimly lit bathroom. Frankly, I'm just not that important (and in the rare, true emergency, I can be reached without the need to be on constant vigil). Observing others engage in this behavior frustrated me no end (it still does), and made me realize that I, too, was guilty of prioritizing electronic communication and connectivity over face to face human interaction. It would have been hypocritical of me not to recognize that I was surely causing in others the same fear, anger, or insecurity that I feel when a client checks emails while I provide legal advice or a friend checks Twitter ten times during dinner. So, I made a conscious effort to be better about it. I put my phone completely out of sight during meals and meetings unless I know an urgent issue is afoot (in which case, I explain in advance to my companion(s)); I try to wait until normal business hours to respond to work emails; and I try respond to personal emails, look at social media, and spend time on this blog during down time by myself, rather than interrupting quality time with those I love and value. I wish I could say this was easy to do, or that I'm really good at it. It's not and I can't (and I'm not really sure why that is). But I'm trying. Lindsay Phillips Switchflops with "Betsy Ross" pattern straps. These are my "go to" summer sandals because the straps are interchangeable to create hundreds of looks to match any ensemble. What on Earth does this have to do with a post-holiday weekend blog post? It's on my mind because in the midst of a wonderful weekend celebrating Independence Day on the lake with family, my 7 year old nephew made me realize that my electronic tether has grown too taut yet again; my incredulity at the family of four ignoring each other at a restaurant last week as every one of them stared into their smartphone or portable game has once again grown hypocritical.... It happened Saturday night on the boat. After a long day spent outdoors, tubing, and grilling out (not to mention some downtime in the hammock), we were looking forward to our small lake community's annual fireworks display, and joined the parade of boats venturing toward the dam at dusk to take it all in. As we sat in the boat waiting for the show to begin and mindlessly eating leftover graham crackers from our campfire s'morestraveganza, my attention was instantly jolted out of social media browsing when my nephew suddenly blurted out that he wished every phone on the boat would fall into the lake. As we all looked around, I noted sheepishly that every adult on board was face down in their phone...and this, after I'd told him in no uncertain terms earlier in the day that we would not spend time indoors playing on the PS3 when the weather was beautiful; we were all together; and there was a lake to be played on. Needless to say, I put the phone down. I have to try harder. 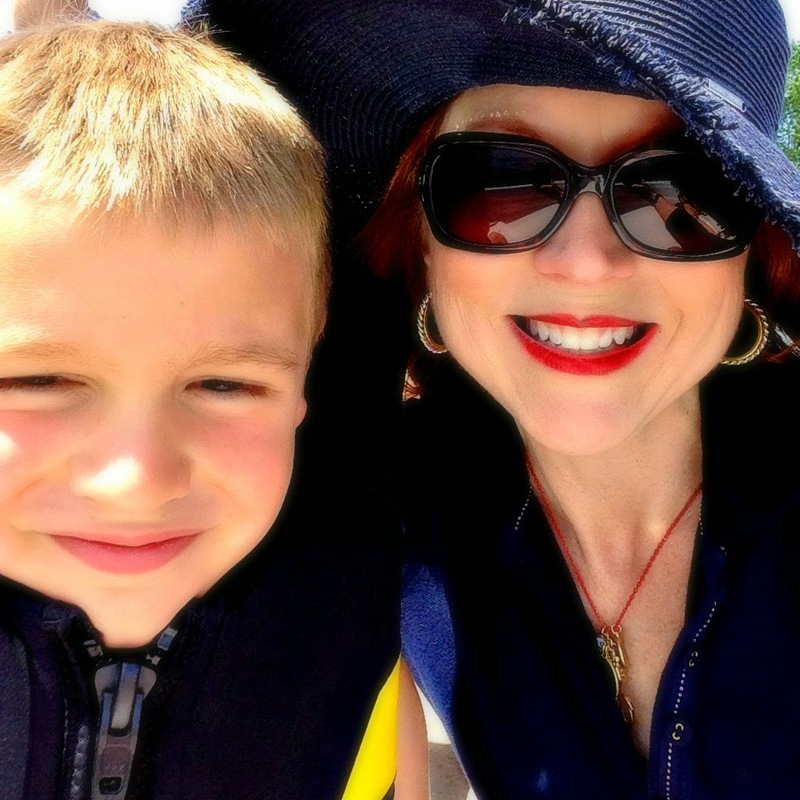 My nephew and I both agree that relaxing on the bow of the speedboat is the best place to be, though I like driving it, too. I love living in a real-life "madras plaid world," but I need to focus once again on being fully present there, rather than in the mad, mad e-world." Check out Style Crone's Hat Attack for more fun summer headwear! I love this very insightful and thoughtful post. You are an extraordinary writer, as well as a beautifully stylish woman. Gorgeous hat! Thank you for sharing with Hat Attack! Thank you, SC! I love writing as much as I love a great hat, so I really appreciate your compliment - it means a lot to me. Love the whole outfit, but particularly the hat. The slightly frayed edges of the brim add a lovely dash of "je ne sais quoi." Thank you, M-T. I appreciate the compliment. Great blog - love the French perspective! I just returned from a holiday in the south of France, where I was completely enamored with the inhabitants' sense of style.